For some it's clothes, makeup and perfume, but for me it's books that I love unwrapping on Christmas Day. Then snuggling down in my new pyjammas with the fire on and a new book to read before the festive day is over and then something to keep me company and escape from the January blues. 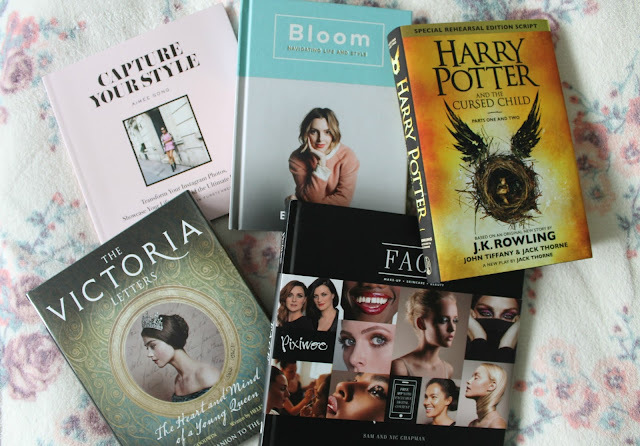 From the looks of my Instagram feed, a lot of other bloggers also got the book Capture Your Style by Aimee Song! My photography is something I'm always learning and wanting to improve on, especially when there's so many amazing bloggers doing a fab job. This books takes you through the technical side of lighting and positioning, but also how to create and maintain your personal brand and style - can't wait to read it! Did you watch the ITV production of Victoria last year? I was addicted to watching it and my Mum took note and got me a book of Queen Victoria's letters. Each chapter is set in key stages of her life e.g. before becoming queen, her move to Buckingham Palace, but the chapter which I'm most looking forward to is with Lord Melbourne, her first Prime Minister and close mentor. So far I've only had a quick flick through of Bloom by Estee Lalonde, but the way she's put together each chapter and complimented it with photos is gorgeous! Books by bloggers are so interesting to read and such a pleasure because it's like an extension of their blogs. And I know I'm definitely going to pick up some great tips from this one! Being a massive Harry Potter fan, it's amazing that I've managed to not read this book before! The Harry Potter and The Cursed Child book is nineteen years on since the last book and focuses around Harry's son Albus. I like the fact that the story incorporated parts of the future and past so it didn't feel too different from the classic Harry Potter books - and it had enough to keep you entertained still. Definitely recommend reading! Pixiwoo are by far my favourite beauty youtubers - their tutorials are so helpful and fun at the same time! This book includes everything you need to know about makeup, how to apply it and all the different types. Plus because it's from Pixiwoo, you know you can trust what they say! There's a free app to go with the book for extra digital content which I'll definitely be downloading too. Have you read these books before? What's your favourite?